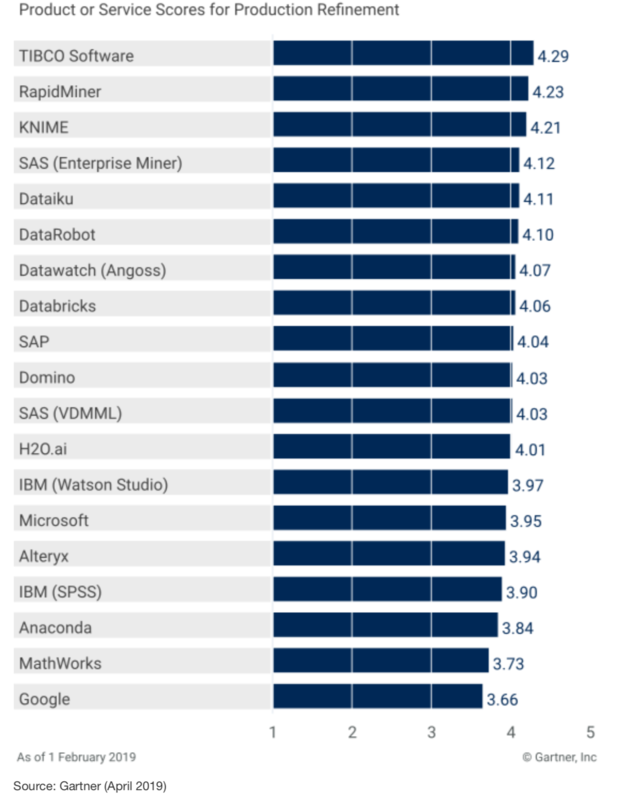 The Gartner Critical Capabilities for Data Science and Machine Learning Platforms 2019 report evaluates vendors on their performance across four different uses cases spanning 15 critical capabilities. We’re happy to announce TIBCO scored highest for Business Exploration, Production Refinement, and Nontraditional Data Science, excelled in project management and collaboration, and also blazed a trail in data exploration and visualization and other advanced analytics. Business Exploration (score: 4.26), Production Refinement (score: 4.29), and Nontraditional Data Science (score: 4.25). If you’re looking for a powerful analytics platform to accelerate innovation across your organization, we believe this evaluative report is a must read. This graphic was published by Gartner, Inc. as part of a larger research document and should be evaluated in the context of the entire document. The Gartner document is available upon request from TIBCO Software.